John 18:15-18, 25b-27 Simon Peter and another disciple followed Jesus. Since that disciple was known to the high priest, he went with Jesus into the courtyard of the high priest, 16 but Peter was standing outside at the gate. So the other disciple, who was known to the high priest, went out, spoke to the woman who guarded the gate, and brought Peter in. 17 The woman said to Peter, “You are not also one of this man’s disciples, are you?” He said, “I am not.” 18 Now the slaves and the police had made a charcoal fire because it was cold, and they were standing around it and warming themselves. Peter also was standing with them and warming himself. John 19:16-18, 25b-30, 40-42 Then [Pontius Pilate] handed him over to them to be crucified. So they took Jesus; 17 and carrying the cross by himself, he went out to what is called The Place of the Skull, which in Hebrew is called Golgotha. 18 There they crucified him, and with him two others, one on either side, with Jesus between them. 25b Meanwhile, standing near the cross of Jesus were his mother, and his mother’s sister, Mary the wife of Clopas, and Mary Magdalene. 26 When Jesus saw his mother and the disciple whom he loved standing beside her, he said to his mother, “Woman, here is your son.” 27 Then he said to the disciple, “Here is your mother.” And from that hour the disciple took her into his own home. 28 After this, when Jesus knew that all was now finished, he said (in order to fulfill the scripture), “I am thirsty.” 29 A jar full of sour wine was standing there. So they put a sponge full of the wine on a branch of hyssop and held it to his mouth. 30 When Jesus had received the wine, he said, “It is finished.” Then he bowed his head and gave up his spirit. 40 [Joseph of Arimathea] took the body of Jesus and wrapped it with the spices in linen cloths, according to the burial custom of the Jews. 41 Now there was a garden in the place where he was crucified, and in the garden there was a new tomb in which no one had ever been laid. 42 And so, because it was the Jewish day of Preparation, and the tomb was nearby, they laid Jesus there. We began Lent on Ash Wednesday confronted with our own mortality. Ashes are smeared on our foreheads in the sign of the cross and we are told, “Remember that you are dust, and to dust you shall return.” A glaring reminder that life on the planet, our baptismal journey, ends in death. Death leaves us longing for the spiritual. But in the meantime, we are stunned by its lack. There is no heartbeat, no breath. All is quiet. From where we sit on this side of death there is no dressing it up. At the bedside or roadside or war-side, wherever we encounter death, it is stark, austere, and unnerving in its lack of immediate meaning. Death is simply absence. Gone. On this side of death, it is nothing more. We begin Lent faced with our own mortality and a sign of the cross. At the end of Lent this Good Friday, we are confronted by the cross itself. Longing for the spiritual, we are stunned by its lack. There is no heartbeat, no breath. All is quiet after the betrayal, denial, ridicule, and execution. The adrenalin fades. The frantic hype is gone. “It is finished.” Jesus’ last words. Finished. All that’s left is to put him in a tomb and leave him there. But the quiet of death breeds disquiet. Unnerved by the immediate lack of meaning the attempts to make meaning begin immediately. Centuries of Christian thought have produced atonement theory after atonement theory. Some more satisfactory than others. Regardless, Gerhard Forde argues that all of these theories hold us “in a false relation to God,” most often reducing Jesus’ death to an unsatisfactory commercial transaction. Time and again in the New Testament, Jesus’ death is explained simply as “for us”. That is all. “For us.” Which necessarily means that Jesus died “for you.” Jesus died for you. Jesus died for you for the forgiveness of sins. Because isn’t that what Jesus did in his life here on earth? With the authority of God, he announced forgiveness time and again, and time and again, until finally he was killed for it. Forgiveness, already available, already announced by Jesus, was that for which Jesus was killed. He spoke a word of forgiveness until he hung on a cross for it. For you. The hands of the betrayer, the hands of the denier, the hands of the ridiculer, the hands of the executioner. Those hands are ours hands in all the ways we take things into our own hands. Determined to put conditions on what God’s gives to us unconditionally, we cannot hear this word of forgiveness. We can’t hear it for other people. And we can’t hear it for ourselves. At the cross, love is freely taken up for us and for the sake of the people next to us. In the same moment, we have everything to do with what happened at the cross and we have nothing to do with it. We are culpable AND we are passive spectators who are being handed a stark realization of our common powerlessness. In this way, the cross cannot be used as a method to live life. The cross is the way we experience life. Longing for the spiritual, we are often stunned by its lack. Yes, the cross is the way we experience life. Humbled by our participation in a death on a cross, made confident through the self-sacrificing love of God. The cross is radically inclusive of all people which necessarily includes you. Jesus says, “It is finished.” Can you hear the whisper? Finished. His final moment. All that’s left is to put him in a tomb and leave him there. Gerhard O. Forde. A More Radical Gospel: Essays on Eschatology, Authority, Atonement, and Ecumenism (Eerdmans Publishing: Grand Rapids, 2004), 221. Anne Lamott. Traveling Mercies (New York: Pantheon Books, 1999). 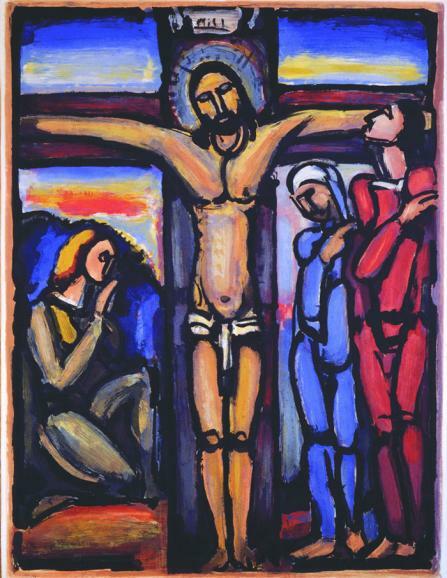 On Good Friday, cross and tomb are the focal point so that hope is reflected out of suffering that is real rather than as false optimism denying painful realities. I went to a Memorial Day barbeque last Monday. You may know the kind. We are long time friends of the people who gave the party but don’t really know the other guests as well, maybe only met some of them once or twice before in the last decade. I found myself standing next to a new acquaintance, chit-chatting with him about the town I grew up in because he had lived there briefly after college. I was enjoying the connection of someone simply knowing background without needing to share it all. From a few feet away came a voice, “I like your leg.” The man looked over to the boy, around 9 years old, and said, “Thanks.” The boy said, “It’s the color of skin.” I looked down and for the first time noticed his prosthetic leg and looked up to the man looking at me, and he smiled and winked at me. Then the boy said, “How’d you lose your leg?” “Hunting accident.” The man looks at me and smiles and winks again. The boy continues, “What kind of accident?” “I was shot.” “Oh, and they had to cut off your leg?” “Yes.” And then, as suddenly as the conversation began, the boy was done with it. When I picture Nicodemus, I see him in firstly in the dark of night, well, mostly because that’s what the story says. And then I see him doing that tip-toeing and sneaking around that we get to see in episodes of Scooby Doo. You know the kind – dink…dink…dink… with lots of looking this way and that way to make sure no one is onto him. He has some questions and he thinks that maybe Jesus has the answers. But he is also an educated man and a religious leader in a group that doesn’t really know what to make of Jesus except they know enough that they’re uncomfortable about him. 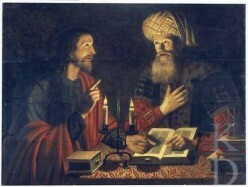 It is out of this discomfort that Nicodemus tip-toes over to Jesus and asks questions. Nicodemus has big questions and Jesus has big answers about being born from above by water and the Spirit and being sent from God into the world not to condemn it but to save it. All very clear and easily explained answers to Nicodemus’ questions – or maybe not. What happened to Nicodemus? In chapter 3 today we read that he’s tiptoeing around at night and in chapter 19 we read that he turns up in the light of day, thudding along with 100 pounds of spices, risking his own life to bury Jesus’ body. We get one other brief verse about him in chapter 7. While we could have a ton of fun wondering and guessing about what happened to Nicodemus, one thing we do know about the in-between time is that Jesus was hung on a cross and died. Nicodemus was not privy to the resurrection at the time of burial. The hinge point for him, indeed for the Gospel of John, is the cross. All the God, Son and Spirit talk in the Gospel of John points us there and draws us, like Nicodemus, to faith through it. But for us, as 21st century evangelists, as bearers of the good news of Jesus, the cross is a tricky place to start. There is the reality of Jesus’ execution on a cross recorded by the Romans as a historical event. And there is the swirling mystery of the Trinity – of Father, Son and Spirit – active on and through that same cross and drawing us to faith through it. But how many of us, and I include myself in this, are prepared to give a neat and tidy speech about why the cross stuff is a good thing to someone who has never heard a good word about Jesus and perhaps is tip-toeing towards Jesus with some questions of their own about him and his church? This week, as the season of Pentecost, the season of the Spirit working through the church begins to heat up, I invite you to think about the words you would use as people of the good news of Jesus Christ. What might you say? Where might you begin? My two friends, my two evangelists, started something with a very simple piece of good news. “It just works me,” they said. And this gave me something to think about all by itself. They kept it simple much like the man at the party kept it simple about how he lost his leg. Obviously, in both scenarios, there is much more that could have been said. Once back in church, while I was nervously tip-toeing about the edges as others seemed to get it, there was one verse that spoke to me – one verse in the whole Bible that made any kinds of sense. 20 years ago, one friend; 17 years ago, one husband; 16 years ago another friend; 15 years ago, one verse! That’s a lot of tip-toeing. Nicodemus went from tip-toeing toward Jesus in the night to lugging 100 pounds of spices for Jesus’ burial in the daylight. There is a lot that happens during the in-between time that is difficult to fully explain. Being born from above is just the kind of thing that is difficult to fully explain. As talked about by Jesus to Nicodemus, the Spirit is involved along with water which for church has meant baptism. One thing I’m clear about is that all the action belongs to the Spirit who, through the cross of Christ, through the waters of baptism, draws us to faith daily. And, in drawing us to faith, the Spirit draws a confession of good news out of us. This is not to be confused with confession of having done something hurtful to ourselves or our neighbor – although the Spirit does that too. The kind of confession I’m talking about is the kind that the Spirit draws out of us the about who God is and the good news that comes with God. The Apostle’s Creed is one such confession as we join our voices with our ancestors of the faith and speak it together. My friends offered me a very different but also powerful confession. I’m certain that their longer confession would blow me out of the water as they bore witness to Christ by the power of the Spirit. And it is these confessions, and others like them, confessions born from above that are the good news shared through us to people like Nicodemus. May the Spirit of God ignite your confession of this good news that is for the world as it is also for you.